It was World Diabetes Day yesterday, the day of awareness that high blood sugar is absolutely not something we should neglect or take lightly. I’m living in Serbia, a country of somewhat more that 7 million people where 710,000 souls are diagnosed with diabetes, with estimated additional 245,000 others who have diabetes but don’t know it and don’t treat it. Those figures are indeed horrifying, and if we as humanity continue with current nutritional habits future surely won’t look optimistic. 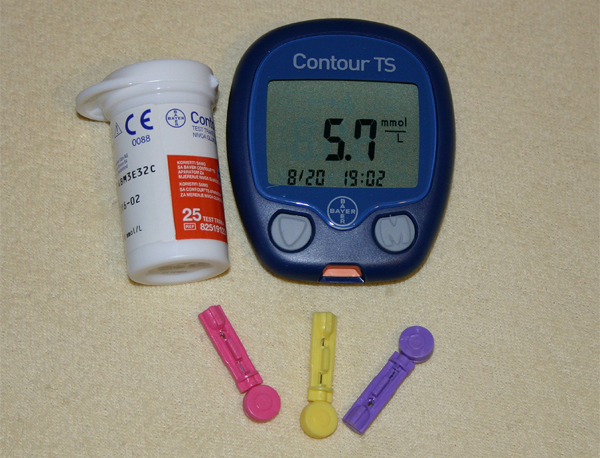 Diabetes is a silent illness and can go for a long time undetected. At the time of diagnose if the patient didn’t check his or her blood work in years, high blood sugar had already made some damage in the patient’s body and shortened the expected length of life. People run away from this diagnose because we all very much fear illnesses that are still considered incurable, but in case of diabetes there is no need for that. There surely isn’t some medication that can fix things and allow you to go on eating whatever you want without a worry in the world, it’s a chronic lifelong illness, but there are treatments that can allow you to live a normal and happy life for many years. My dad was a diabetic for 22 years and as a medical doctor he strictly obeyed the nutritional plan he had to stick to. He couldn’t eat cakes or sweetened things, but he had a perfectly normal life, and what’s much more important his diabetes didn’t progress to provoke some of serious complications such as diabetic polineuropathy, gangrene, loss of eyesight, stroke… to name just a few. Yes, he eventually died of cancer and today we can only debate on the link between the diabetes and his pancreatic cancer, but he died at the age of 78. He was my dad and even he died at 98 it would be painful and I would ask myself if he could go on for maybe a little while longer, but I must admit that he still managed to live a reasonably long life without any serious problem up until virtually one month before he passed away. In the whole 2014 up until the end of July the only symptoms that could indicate cancer were certain weight loss and some changes in bowel habits which were attributed to his new combination of medication for diabetes. At the beginning of August the first dramatic symptom was a rapid, violent onset of blood sugar spinning totally out of control even though he still took his therapy and ate as usual. I was later told that we would never be able to tell if the diabetes had caused cancer or it had been the other way round, the only definite certainty was that it took too long for doctors to establish the type and dosage of insulin shots to stabilize him enough so that he could at least try any true oncology treatment. All in all, dad had 22 wonderful years in spite of diabetes and as he followed all the advice and rules of his treatment, he didn’t even depend on insulin till the last 3 weeks of his life. I would just like to encourage everybody out there to check their sugar values regularly especially if you’re over 50 because this is a borderline age for a possible onset of type 2 diabetes, particularly if you have genetic predisposition or if you indulged in too much sugary and processed food before in life. Don’t let thing spin out of control and lead you into a situation where you could start drinking massive amounts of water and going very often to the bathroom, which if left untreated can lead to diabetic coma that can have even a fatal outcome. There is absolutely no need for this to happen with an illness that in many cases just requires caution, therapy and discipline. On the other hand, if diabetic with a good therapy that keeps diabetes under control, bear in mind that any sudden and dramatic elevation of blood sugar values especially if associated with stomach pains must be immediately reported to a doctor who has to perform an abdominal ultrasound. Take care of your health and never let an illness that can be prevented or successfully kept under control influence your life and your happiness. Diabetes takes some kind of tool on human body even when treated and I am aware of that, but I think that you would agree with me that 22 years of normal life is not that short at all. 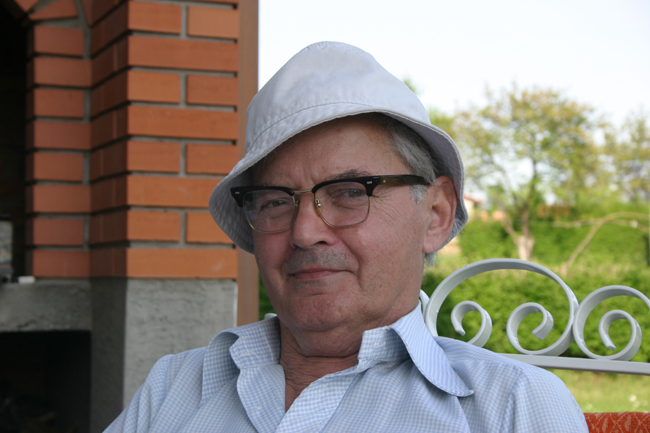 In those 22 years dad was never in the hospital, at the beginning still worked as a doctor, never suffered a heart attack or stroke, he had incredible stamina and strength and in all that time he was in bed 3-4 times for several days with merely a seasonal flu. He traveled, worked strenuously in the garden, enjoyed a full and happy life. I would have nothing against such scenario if I got diagnosed with diabetes. With lots of love for all of you out there, take care! 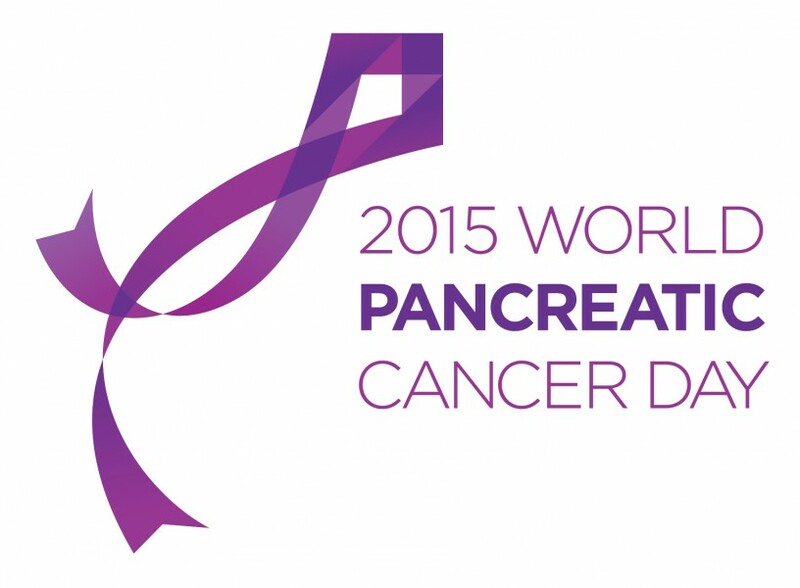 Today is November 13th, World Pancreatic Cancer Day. This year, it’s also Friday the 13th and many people across this planet believe that Friday 13th brings bad luck. For those newly diagnosed with pancreatic cancer, any day on which that happens is like Friday 13th, because this is one of the worst and deadliest forms of this evil disease. Only 1-3% of those who receive this bad news from their doctors will survive the diagnose, and the survival rate hasn’t improved in more than 40 years. It’s still considered to be too hard to be understood and underfunded type of cancer. It’s hard. It’s more or less rare. It happens to somebody else. Until it happens to you or someone very close to you. Then the statistics won’t matter and it won’t seem that rare at all any more. You’ll want the cure, any cure, any support or good word of hope to cling to. But if the situation in the world still stays the same and if research for pancreatic cancer doesn’t broaden, nothing will change, there will be no cure. And with this diagnose, it is much more likely that you’ll end up among those 97-99% who won’t survive. The course of the disease is horrible and it doesn’t impact just the patient but also his or her immediate surroundings. Those days eventually end, but the horrid scenario behind them plays and plays over and over again in the heads of those who stay to live after the patient passes away. You survive, but you’ll carry the scar in your soul for as long as you live. It’s a silent cancer and very often gives symptoms only when it’s too late for everything and everybody. That’s why the information about it has to be spread and shared so that it can be caught when there is still chance to do something. If there is enough awareness, maybe we can save some more lives. Maybe we can improve that hideous statistics and increase the survival rate. Maybe we can help some child to still have a mother or father, brother, sister, aunt, uncle, relatives… If we do something maybe there can still be some hope, even though I can’t be certain about it. But on the other hand what I can be certain of is that if we don’t do anything, nothing will change and there won’t be any hope. I’ll dedicate the rest of November to talking about this disease to try to help in the memory of my father. If you read this today, wear purple. Talk about how important pancreas is and how vital it is not to overload it with sugar, processed food, bad fats, alcohol and tobacco. Go for regular yearly abdominal ultrasound checkups and encourage someone you know to do the same, it can save a life. Abdominal ultrasounds are not just about pancreas but all the rest of your digestive system, and if for some malignant reason cancer strikes somewhere inside and you leave it undetected, it’s the perfect spot for it to spread very easily. Don’t be scared of checkups, once you complete them and they give you clean bill of health walk out of that office and put your worries aside for another year. Take care of your body and life, it is your life I know, but there are people out there who love you with all their hearts, your life is theirs too as your misery in case something happens to you will most certainly be their misery too. Don’t let yourself and them suffer if it proves that something can be done. And if you or someone you know survive thanks to the awareness you provided, there is nothing in the world that can be compared to that. We’re all on this planet for a short time and if we save at least one person, that’s what truly fulfills the purpose of our life. As November 15th was getting closer and closer, I had to get myself ready for paying the share of bills my dad used to cover. If I get the money for the job I occasionally do, this is my obligation. If not, then me and my mom have to come up with some incredible idea how to make the ends meet as her retirement money can’t cover all our bills and at the same time also sustain our food for 30 days. I got some money this month, but in addition to regular bills I also had to cover the last quarter of the annual tax for the apartment we live in, which is over the limit of the budget I receive. As I was making calculations and borrowing the additional necessary sum of money from the limit the bank allows on the only credit card I hold, I suddenly found myself in the middle of some kind of commercial for the American Express credit card the bank clerk was giving her best to make me take. As I was laughing out of misery over her shiny counter while trying to explain to that fancy woman that she was knocking too hard on the wrong door, she went on to elaborate on the wonders of what the travel health insurance that comes with the American Express can do. It virtually provides you with the health insurance that covers the trips all over the world, as opposed to MasterCard’s insurance which is valid for Europe and Turkey only. She continued with praises as to how this is wonderful if I travel a lot, especially if I have a family of my own. Another involuntary stab into my back from her part because obviously she thinks that if she works in a bank for a great salary, has good health and a husband and two kids, that everybody else is like her. Maybe “normal” people are, maybe that’s how things usually work or should work. And as they don’t work that way in my case, maybe that simply means that I’m not “normal”. Whatever. When she asked if I travel, I replied – No, very rarely at the moment. What I should have said was – No, I don’t travel at all. A) I have no money. B) I’m an agoraphobic, I can barely stand an hour drive from home to the cottage house. You don’t need the American Express health insurance for the village at the outskirts of Belgrade. C) I might as well die without bothering the health services – it’s just my mom who would notice the difference, the world couldn’t care less. When she asked if I’m married, I said – no, I’m not. She replied – oh that’s not a problem, when you get married, all the members of your family will be insured as well. She said this as if getting married were some sort of undebatable truth, almost an axiom: you’ll get married, period. What I should have said was – No, I’m not married and I’ll probably never marry. A) I’m 39 and living in Serbia, people are already married at that age here if they marry at all. B) I’m 39 and female, it’s getting highly unlikely that I’ll have kids if I ever marry. Serbian men usually run away from women like me. C) I have panic disorder complicated with episodes of extremely severe agoraphobia. It’s not a flu and it won’t go away. Men in Serbia have many much younger women without mental health issues at their disposal. D) My father died of cancer and I resemble him so drastically that I can almost bet that what I witnessed will be exactly how the end of my days will look like. Panic disorder runs in families and is inherited in 86% of cases. The type of cancer my dad had is also very often inherited, and I can’t go and have my pancreas and the rest of endocrine glands taken out as a preventive measure to secure myself a long and healthy life. I still need to somehow digest the food that I eat. The ethical question is whether or not should I create another human being and leave it on this planet with extremely high probability of being condemned to this terrible fate… life is hard even on its own. So, where were we – basically yep, no thank you, I don’t need an American Express card. The commercial was great and the offer tempting, but you picked up a wrong target. Thank you again, but NO thank you. I think that the bank clerk would be amazed what kind of life baggage could be hidden under a credit card commercial carpet. While I just wanted to get rid of my November bills, I actually managed to get my self-esteem deflated to zero and below by the time I was pushing that expensive double door to run away to the street and get some bank-free air. I left aside barely enough money to buy a dental floss. It’s my life savior, as without it my dental pockets would require the hideous emergency pocket cleaning and eventually degenerate into paradentosis. More money. More pain. I used to visit my dentist regularly, now I can’t any more. I entered a DM store, heaven for every Belgrade woman in love with makeup and style. High quality German brand in combination with every other world’s best cosmetic brand you can think of, and on the top of everything tasty organic products. Almost perfect, if it didn’t require a lot of money. I grabbed the floss and as I was walking towards the cashier, I spotted a winter scarf. 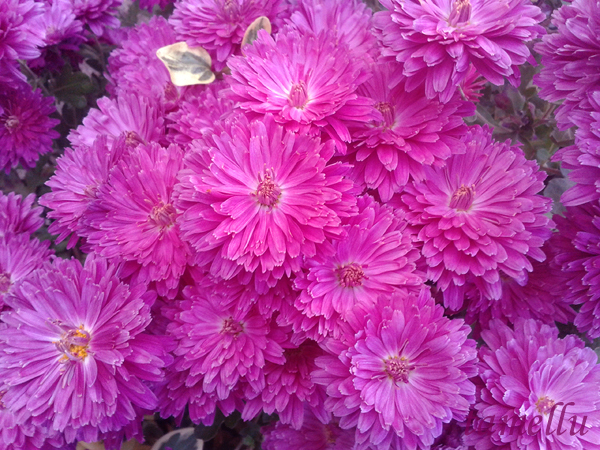 Lovely colors, stripes in all shades of violet from the darkest to the lightest. That’s me, my color, the one I like the best. I didn’t like the price though. Seven dollars. In America, that can probably be defined as cheap by many people. In Africa, that’s a whole world for a poor person whose village is miles away from food and water. In Serbia, it’s somewhere in between if you belong to what used to be defined as middle class. I don’t any more. So I paid for my floss and went out making sure that I arrive home as soon as possible. Not so much because of agoraphobia, more because of the fact that from the terrace of my apartment you can’t see any banks or shiny department store windows. There are just trees, little wood that can never remind me so harshly that I am a failure. Nothing to buy, nothing to sell, no credit cards, insurances or scarves. Just nature. Thank God for that. I just need a constant reminder that I should stay here as much as possible because going out there among all that “normal” people strongly aggravates my depression. Also, I have to remember not to make shopping lists. Instead of writing things down I need some sort of mental pencil to cross out every single item that comes into my mind. I can do without things, as long as I’m not hungry and capable of covering the basic needs. That’s for now. What will happen tomorrow? I simply can’t think about it. I don’t make plans, I have no means for that. It has nothing to do with panic, laziness or depression, I sent out dozens of job applications willing to push over all my limits, but with no success. Qualifications are not a problem, but age is. 39 seems to be way too old for any Serbian employer, plus the country is in quite severe recession. Life in Serbia is very hard, even without my issues. I’ll leave this post as a reminder that I absolutely must block all shopping desires that come into my head because it still won’t come naturally, I’m doing my best to adjust to this new life I have to live. It’s livable, it surely still is life. And all that stuff we tend to consider important or even essential at any given point of time can be done without. People matter, not things. 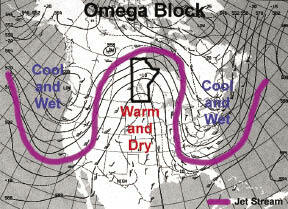 Just what is an omega block? 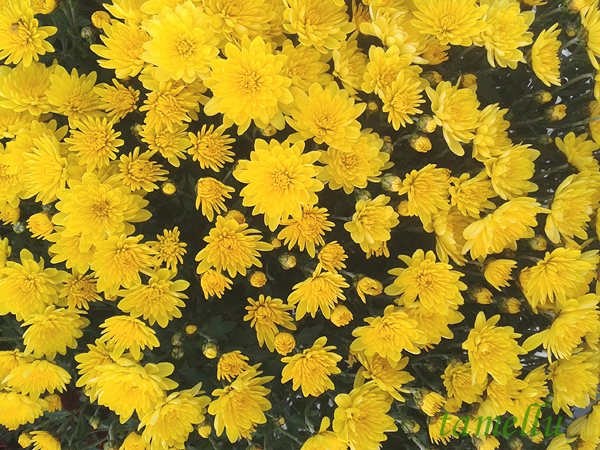 I first found out about these flowers when the best friend of my grandmother brought them into my life – she used to grow big beautiful yellow chrysanthemums in her garden and it always fascinated me how this plant defied bad weather, first blows of frost and first flakes of snow. 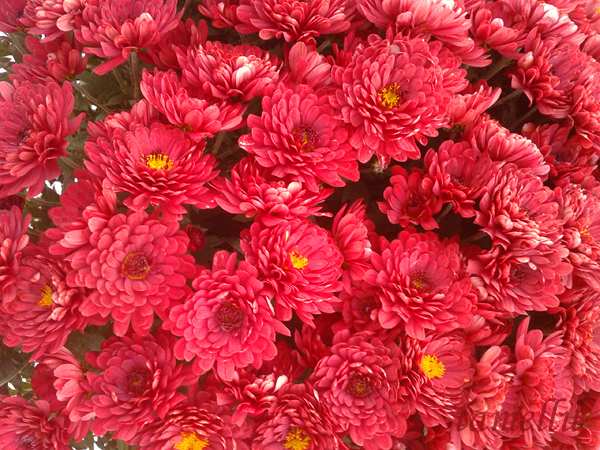 Flowers are associated with spring, with the first rays of early March sun, while in autumn everything shuts down and prepares itself for yet another long sleep. 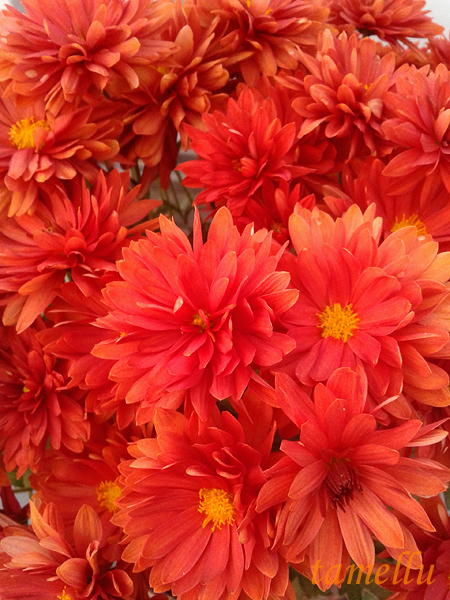 Almost everything, apart from chrysanthemums whose splendid colors explode to brighten up first gloomy days of October. They are such a pretty site, but you have to wait all year long to see them bloom for this short, late time. You have to be patient, the best and most beautiful things in life require perseverance and patience. 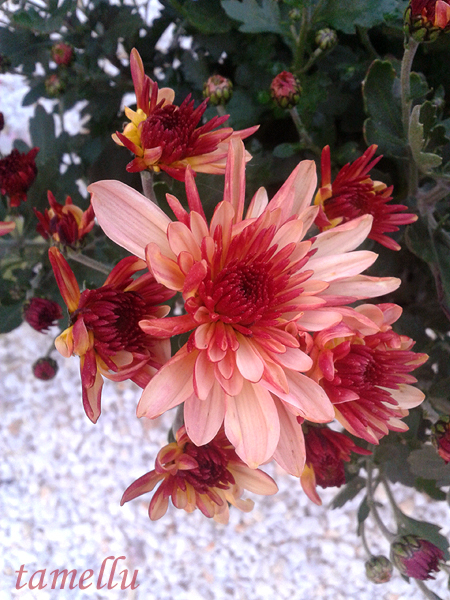 Also, you have to be punctual, because if you miss them you’ll have to wait for another year to see them bloom again. And a year can be a very long time, once I used to say very casually and confidently that I would do something or go somewhere next year, it went without saying that the next year would come, then another next and all the other nexts after it. Today I’m much more cautious when I want to say a thing like that, now that I felt all the fragility and uncertainty of life in the closest possible proximity. 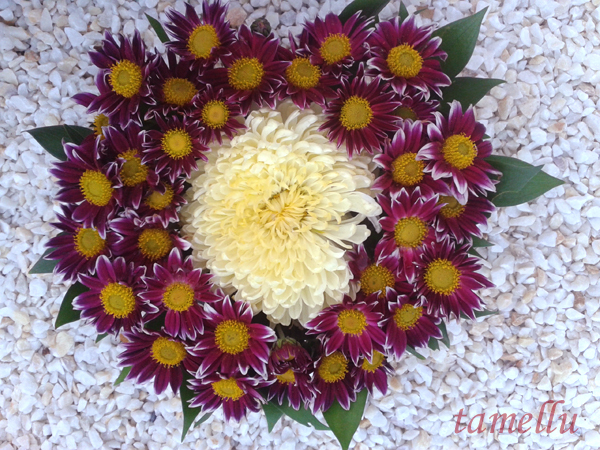 Chrysanthemums will always remind me of it. I was always inclined to first perceive the bad picture when I summarized the event of the day, month or year. Quite sadly for a long time that was actually the only picture I perceived, unable to confront it with its opposite counterpart which always exists, no matter how dark is the darkness we sometimes found ourselves in. Flaw of the character or simply the consequence of my mental health issues which colored my days with the gray filter of depression even long before the tragic loss of my father, that was who I was and still am to a certain point. It just took a completely new shape in this last year or so because even when things are funny or I begin to smile, it is never again that relaxed bubbly laughter I used to enjoy in the past. It doesn’t matter how old you are or how independent you are at the time when you lose your parents, it’s only then that you truly become that mature grown up adult, one of all those other adults at that given moment world has now to rely on. Those who shaped that world before slowly leave the scene and you find yourself more and more alone in front of the big audience to show all you can and cannot do. Till then you always had somebody who could in case of necessity watch your back, give you advice, replace you for a moment or two. Perhaps you didn’t use that backup option at all, but still you knew it was there, like a comforting emergency button you could push at any given instant, a person or persons who would never betray you and always be there at least to give you warm two cents of their own. When you lose that, again no matter at what age, you lose the unconditional ground under your feet and your time comes to shape some tiny piece of this planet in your own way. It was easy to criticize or watch from a safe distance the previous generation at every possible work you could imagine and say that you would do it better if only they let you – when your time comes you see how hard that task is. How easy it is to make mistakes. How many insecurities and unknown things lie even in some seemingly simple everyday tasks you weren’t involved in. You realize that it’s not easy at all to shape the world. That this is new time frame but that people are still people, that your generation isn’t much better or worse than all the previous generations. That you missed so many important lessons, but that you have to do something, without creative and not so creative blocks inside that just serve as an excuse for – oh that’s too difficult, strenuous or tiresome, I’ll leave it for tomorrow. You can’t leave it, because there are not so many tomorrows out there any more. It’s scary and requires responsibility. But that’s how it is. This realization leaves you with some sort of mature scar on your soul, a scar that makes adults adults and alienates them from the carefree strength of a happy childhood. I used to be extremely sad in this past year, now life is somewhat more frozen in several shades of gray the mature realization that I’m alone to fight now consists of. Life is hard. Literally. Things around you weigh a whole ton when you try to lift them and there is nobody else to do it for you any more. I have 57-58 kilos now and I probably shouldn’t lift anything heavier that 10-15 kilos but I have to. Nobody asks if I can. And anyhow I was never used to transferring the weight from my shoulders to other people’s backs. This heaviness of life serves as a burning fuel for depression which in turn continues to force me to see mainly just the negativity in the world around me. I’m aware of that. I see that others are aware of that too – people don’t like simple reality, they strive for inspirational heroes even if they are just a myth because people in general are much less brave than they pretend to be in front of others. What counts is what you think and how you feel when you stay alone with yourself in front of your bathroom mirror and honestly face your true reality, and there are not many of those who would sincerely share such moments with others. Nevertheless, if you’re honest, people flee. They run away from you, they don’t call you, they leave you on your own to “pull yourself together”. They can’t listen to negativism, they search for inspiration. People are just – people. When I used to actively fight against panic disorder I read all sorts of psychological texts from the field of self-help and I tried out all sorts of techniques to simply survive a day. One of them which was dedicated more to the fight against depression than with panic was to write down your negative thoughts, at least several a day and then find as many good things in that day to confront the negativism with. At first that is extremely challenging because you simply can’t see anything good in horrible days. They you do somehow squeeze out good moments onto that paper, but they seem totally insignificant. With time and practice it gets easier, actually they say that if you practice this long enough it can become your second nature to first see the good and only later the bad in your days. I was never patient enough to give it a decent try so I don’t know if it works on the long run to improve the thinking patterns, but I know that it was a helpful tool on some pretty rainy days. 1. Remember kitten Maconi from the photo post? Well, it’s not at the cottage house any more nor it will ever be. There are two people who live there in the immediate surroundings all the time, but they both refused to take care of it during the winter by saying that they don’t have the food for a cat??! My uncle wants to spend a carefree wonderful winter abroad so he won’t be here for at least 3 months. For that reason the kitten was sent away to some distant yard, it’s quite unclear if it will be taken care of or abandoned to search for food by itself during winter. 2. The first neighbor at the cottage house who was ill this last year and a half died today. My father would be very sad if he were here to hear the news, I remember their adventures when they walked for miles in good and bad weather when the buses would break down and there was no other means for them to reach their cottage houses in the past when the village wasn’t well connected with the town. 3. I have strong back and muscle pains due to heavy duty work at the cottage house yesterday – the place doesn’t look small at all when you have to collect leaves and heavy rotten apples to carry them away, there were 100 kilos of rotten apples to be collected in order to prevent trees to catch illnesses. Then I went up and down the ladder for like 50 times, quinces are finally ripe – the wind was blowing like crazy, branches were hitting me in the face and I was losing balance and almost falling down from some crazy heights. 4. I was following this year the life of one very special Serbian female writer, Isidora Bjelica. She was diagnosed with ovarian cancer 3 years ago and went into two remissions, but the disease stroke back again in April-May this year for the third time. She tried vast number of expensive therapies, there were big humanitarian concerts as people gathered to collect money so that she could be treated in Switzerland, she promised to fight the best she could with lots of love for her fans and every single person who gave her a friendly word of support on her Facebook page. She posted that the imaging tests done today showed that her cancer spread very much and very aggressively. I felt the blow of heavy sorrow and those same mixed emotions I wrote about that haunt me for a very long time now. 1.In spite of pains I managed to bake a bread. And it turned out really excellent and tasty, I hope that I finally nailed the recipe that I should stick to. 2. Quinces are hard to collect and they have very unique taste, but they are also such a pretty site to look at, plus their smell is amazing. There are beautiful songs about quinces on cupboards during winter in our tradition. 3. It is hard for me to go to the cottage house, but I’m giving my best to convince myself that it is nothing and that I can do that. I’m fighting agoraphobia the best I can. 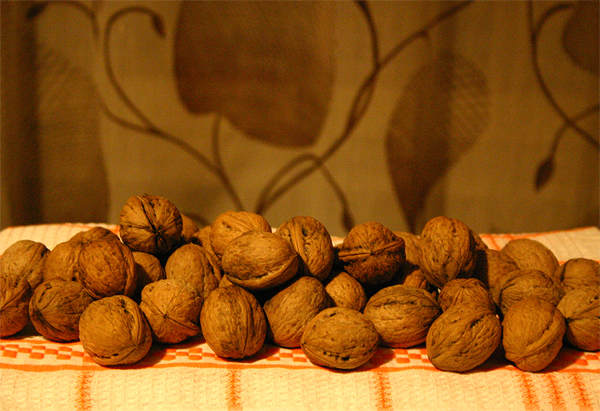 This is what I’ve been pretty much up to these last days – collecting nuts, golden fruits of autumn. There is a whole story behind it, a hidden meaning that makes them special for me – I’m getting it ready for Tuesday. It’s been quite a while since I last reached out to the great big world out there. It was more a conscious decision than a spontaneous act, I felt frozen in my grief and short for words that somehow couldn’t find their way to come out. I gave up, everything seemed pointless, as if my dad had taken all the colors out of my life and carried them away as he left the Earth behind. I suddenly found myself on a no man’s land, beaten up by dad’s vicious and extremely complicated disease that eventually reduced me to almost nobody and nothing. No happiness, no smiles… no self-esteem, no friends in the hard days of grief… no family of my own, no job, no creativity… Then I suddenly realized that the mortal blow of cancer didn’t have just one victim. I became its true collateral damage, as I continued to live a negation of life. Yes, you can be just technically alive even when not on life support. Cancer in some way killed me as well, even though I wasn’t the one diagnosed with the illness. I somehow stopped living and shut myself up and out of everything, blogging included. Did this help? No, not at all. I foolishly opted for “peace of mind”, trying to believe that this will help me heal, that something else will happen on its own and take my life on a different, better course. Nothing happened. Nothing good. As if the Heaven decided that it’s high time for me to learn the hardest way all those lessons I missed as I grew up. As if time came to pay the dearest price for every mistake I made as I walked down the path of my life. My dad has been “missing” or a whole year and a bit more now, but I’m somehow still waiting for him to come back. It didn’t seem real, it seemed that he fell asleep the way he had done thousands and thousands of times before that horrible day, and it still seems that he just has to wake up somewhere out there and come back. I have a feeling that it will stay forever that way for as long as I’ll live, no matter how long that can be. There were many occasions on which I desired to join him, as staying alive feels painful and pointless. Then I realized again that letting go would mean another victory of cancer as well, which in turn if my life is pointless is totally pointless on its own. I was given this life… why, how and where I don’t know, but I know that it should fulfill some purpose. I want at least somebody to remember me by good when I pass away. I need an opportunity that can help me give my days some meaning. I don’t want to let my knowledge go completely down the drain as something unnecessary and useless, I put way too much effort into it to let this happen. However, I can’t do this entirely on my own. As every human being, I need people to keep me company, to listen to me, to give me some feedback, push me further when I get stuck, remind me that there is some sense in what I do. If as it seems I can’t earn an opportunity to work out there in my real life using the languages I studied, I can at least make myself blog. It depends entirely on me, nobody can take that away from me for as long as I have electricity, internet connection and some device to type from. In the end, the only thing I overdo every single day is thinking, it just has to be converted to writing. I decided to try to publish whatever I manage to put together on Tuesdays and Thursdays and perhaps a photo every Sunday. It won’t be easy to stick with this decision, but even just a line or two can make the difference on harder, sad or busier days. I hope that someone out there will be willing to bear with me and give me from time to time a friendly word of support as I struggle to get back on some kind of track. I am not who I used to be nor what I used to be, I miss that person who existed until a year ago very much. But you know what, this person who writes these lines today might well be just a smaller and worse version of the girl who isn’t here any more, yet she still has something interesting to say and show to the world, I’m sure about that. Be well people… and I can only hope that with time I’ll manage to earn interest, trust and friendly words of support. I wish somebody told me long ago that there wasn’t and isn’t time to waste in this life. I know that all the people I was surrounded by meant the best for me and wanted to protect me, creating the illusion that I have “whole life” in front of me, that if I fail or miss an opportunity I’ll make up for it tomorrow, or next week, month or even a year. I believed in that illusion and “took it easy”, procrastinated, searched and researched mainly the things I liked and that appealed to me, without considering if they had any true practical application in this world. When panic disorder did its best to halt me in every possible way, so many times I retreated in order to suffer less, exchanging freedom for tiny insignificant moments of instant relief. I thought that I was still young and had time to recover to a certain extent and do something more in life. There is time, I repeated over and over again, till my world tumbled down full force onto my obviously pretty immature head last September when my dad died. I started realizing how many life trains I missed and how many important skills I didn’t learn, foolishly assuming that “dad would do that” or that some things would somehow resolve on their own with time. I subconsciously trusted that opportunities would find me when I need them, and that I wouldn’t have to go searching for them instead. I stopped counting mistakes as their astonishing number fills my soul with tremendous pain. There wasn’t time, I just didn’t realize it. Now that I do realize it, it completely elapsed. It’s too late. I should have chosen a completely different profession and focused on making some living and something of my life. I should have searched better for a soulmate and created some sort of home of my own on my own or with somebody else. I should have led a better fight against my demons and at least accomplished last spring what I can do today. I should have continued driving after I got the licence almost 15 years ago. What did I do instead? I closed myself in my room, waiting most of the time for panic disorder to pass. Unfortunately, it’s not a virus and it doesn’t last 7 days. My dad passed away sad and disappointed with me. I’m not very sure that he loved me much towards the end the way he used to years ago, and if I’m right I can’t blame him. I’m supposed to know myself best, and even I can’t define myself well any more. I mean well, I would like to help and do some good, but nobody is willing to hire me at 38 for some extra work, I’m “too old”. I can’t help mom much with the bills or drive her somewhere. Procrastion led me to the point at which I don’t only mourn my dad’s death, but also question the sense of my existence. The more time passes, the more I am convinced that it would have been much more fair and just if I died and my dad stayed to live. I feel completely useless, I’m just a burden with all my incompetence and health issues. I can’t even afford to fix the computer that broke down again, so I can’t be consistent even with just blogging. Everything seems to be against me, yet I still defy it – I’m blogging from the phone. Hopefully it won’t break down as well. So to whomever reads this – don’t procrastinate. Whatever needs to be done, do it now. It’s ok to be sorry when you lose someone, but you don’t need to be sorry for all the wrong choices and missed opportunities as well at those sad moments. No matter what fairytales or other say, don’t believe them – there is no time. No time to lose.